A tenth-anniversary celebration of the work of the St. Thomas More Group, including a variety of music by its members, both past and present. 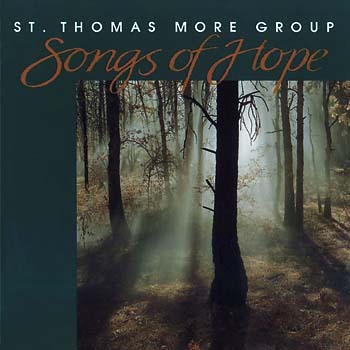 This collection, celebrating the tenth anniversary of the work of the St. Thomas More Group, features songs by its members, both past and present, including Stephen Dean, James Walsh, Bernadette Farrell, Christopher Walker and more. With music that covers a range of liturgical moments, seasons and rituals, Songs of Hope is versatile, offering 16 songs for assemblies large and small. Anne Quigley’s well known “There Is a Longing” appears here and is suitable for a small gather with, for example, guitar accompaniment, or for a larger assembly with keyboard, choir and instrumental parts. “As the Setting Sun” presents the ancient “O Joyous Light” hymn in a contemporary version by Peter McGrail. Its references to the daily cycle render it best-suited to worship at the close of day, especially during celebrations of Evening Prayer or during a candle-lighting ceremony. Other songs include “Our Help Comes in the Name of the Lord” from Tony Barr, based on Psalm 121 and James Walsh’s “Alleluia! Praise to Christ,” which could be used as a Gospel acclamation or for gathering or as a processional song for a big occasion.